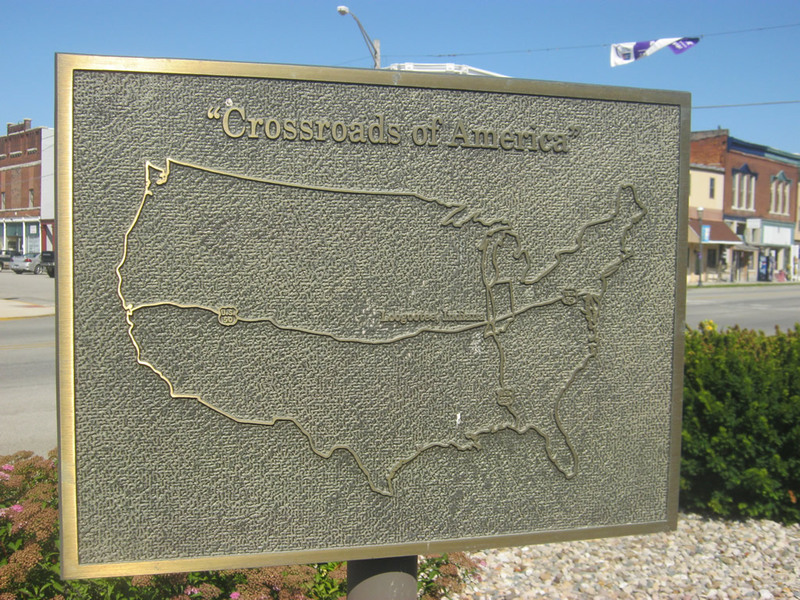 In Downtown Loogootee, a plaque acknowledges yet another "Crossroads of America" in Indiana. This time, it is for the junction of the cross-country U.S. 50 and U.S. 231, which meet just a few blocks to the south of this location. Photo taken by Thomas Decker (06/06/12). U.S. Highway 50 stretches for 171.53 miles across the south-central part of Indiana as a part of its overall 3,008 mile journey from Ocean City, Maryland to West Sacramento, California. In Indiana, it serves the communities of Vincennes, Washington, Loogootee, Shoals, Bedford, Brownstown, Seymour, North Vernon, Versailles and Lawrenceburg. Due to the fact that the highway isn't followed by a major interstate, it remains a well-traveled route, even though it is two-lanes for the vast majority of its journey. Only on the western and eastern ends is the highway multi-lane. The highway is a part of the Indiana Historic Pathways scenic route that covers both U.S. 50 and U.S. 150, with various historic and cultural attractions along the way. For a more detailed history about the U.S. 50 routing in Indiana and the historic alignments of the highway, see Jim Grey's website on U.S. 50 across Indiana. This website goes over more of the historic alignments of the highway and the history of the towns the highway goes through, or did go through. This guide will follow the current alignment of the highway. Two blocks south of U.S. 50 (16th Street) and downtown Bedford, Mitchell Road (Old U.S. 50) crosses the intersection with 18th Street. Green Hill Cemetery is situated on the east side of Mitchell Road south of the intersection. Photo taken 07/03/09. Mitchell Road (Old U.S. 50) is an older four-lane highway that once carried U.S. 50 to the southwest of Bedford before it joined Indiana 37 across the East Fork of the White River. Today, the highway carries a local designation of Business U.S. 50. Photo taken 07/03/09. An older button-copy sign directs travelers along Mitchell Road (Old U.S. 50) to the ramp that will take them north along Indiana 37 north & U.S. 50 east toward Bloomington and Indianapolis. Indiana 37 south & U.S. 50 west traffic will merge with Mitchell Road westbound traffic at the upcoming interchange. Photo taken 07/03/09. Indiana 1 concludes at the intersection with U.S. 50 and the ramps to Interstate 275 in Greendale. This view looks at a shield assembly posted at the junction. Photo taken 04/03/10. A view of the exit ramp from Interstate 275 to U.S. 50 and Indiana 1 in Dearborn County. The cities of Aurora, Lawrenceburg and Greendale are listed as controls for U.S. 50 west and Ohio for eastbound U.S. 50. Photo taken 04/03/10.